Can Scratch & Hour of Code Help Your Kid Learn Programming? Coding for kids. Is it a fad, a trend or a movement? Whether or not it's here to stay (codeSpark thinks it is), it has definitely arrived. Code.org has led the charge, giving millions of people a chance to learn programming with the Hour of Code, and even getting President Obama to ask America to learn computer science and personally participate in an Hour of Code. But what does coding for kids actually mean? The benefits of these programs aren’t limited to the field of computer science – according to Bill Gates, “Learning to write programs stretches your mind, and helps you think better, creates a way of thinking about things that I think is helpful in all domains”. As the nephew of Dennis Ritchie, developer of the C programming language and co-creator (with Ken Thompson) of the UNIX operating system (and, don’t remind me, the brother of Sam Ritchie, featured for his own programming accomplishments at Twitter in Wired magazine) I’m thrilled with this progress. But, as parents want their kids to learn programming at younger and younger ages I wonder, what exactly does it mean to introduce a 6 or 8 year old to coding? Do we really expect kids that young to master C, or become proficient in Python? Or to be interested, even a little bit, in the skills we’re trying to teach them? How Can You Get Your Kid Interested In Coding? The solution to the problem of getting kids interested is self-evident – make it fun! The Hour of Code has made an introduction to programming fun, but making programming, real programming, fun isn’t easy. That being said, there are some very smart people working to make programming fun for kids – namely those at the MIT Media Lab who created Scratch. 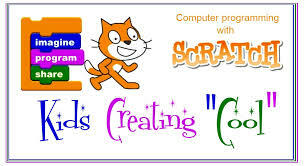 Scratch is a fun, easy to use, drag and drop programming language that kids can dive right into without any prior experience. Does Scratch Really Teach Coding for Kids? Mark Engelberg, former NASA programmer and inventor of our newly released coding game 'Code Master', was one of the original beta testers for Scratch, and has used it in his classrooms. He agrees that Scratch has had a very positive impact: "Scratch burst on the scene as a wonderful, playful way to get kids excited about programming. And it worked. Scratch (along with many other similar programming activities for kids) has helped kids to think of themselves as creators of programs, not just consumers." If that sounds like a criticism, it’s not. Nothing on this Earth will make any but the most precocious 6 year old a programmer – and that’s the point. As much as we all want a world filled with little programmers, the real goal should be to prepare kids for an education in computer science by ingraining the right thinking skills. To achieve that goal, we need to keep three things in mind. Make coding more accessible & achievable. Ingrain important thinking skills into kids. Learning through play is key! Scratch, Code.org and many others are doing the first bit perfectly – I want to talk about how to do part 2. The real goal at a young age shouldn’t be to actually teach coding for kids, it should be to instill the thinking skills that will prepare them for coding and beyond. Watch the video below to hear Mark talk about the theory and inspiration behind Code Master. So if the key is Logic, and the route is learning through play, what can you the parent do to get your kid on the path to programming? Logic Games Are Great - No Screens Required! -Rush Hour: A classic traffic jam logic puzzle. -Gravity Maze: A marble run with a logical twist. -Code Master: Our new programming logic game - the more complicated challenges include coding principles like conditionals and do-while loops. Click below to read 26 5-Star Reviews of Code Master! -Remember that thinking skills are only half the battle - get your kid playing Scratch to make coding fun. If you do want your kid interacting with a screen while they hone their logic skills there are good options out there. Games and Learning recently published an interview with Grant Hosford, CEO of codeSpark and creator of “The Foos”, a digital coding game with similarities to Code Master in that you move your avatar by setting up a sequence of commands, rather than clicking a button or moving a piece - an excellent way to instill logical thinking skills. Read more on that here. Programming is everywhere, kids are being encouraged to learn. How to teach your kid or prepare them to learn to code at a young age isn’t clearly defined. Learning through play is the way to go. Use Scratch, and supplement with logic games. Get your kid playing puzzles and games, on screen or off. You don’t need a screen to take the first step on the path to programming. Want to read more about kids and coding? Check out our other posts here, or subscribe to stay up to date - there's plenty more coming, and our subscribers are entered to win free games every month! Click here to read CoolTechMom's great review of Code Master!